For those who live in East Vancouver or who are very familiar with that area of the city, this hyper-local pantomime was created for that audience and contains endless references to their neighbourhoods. 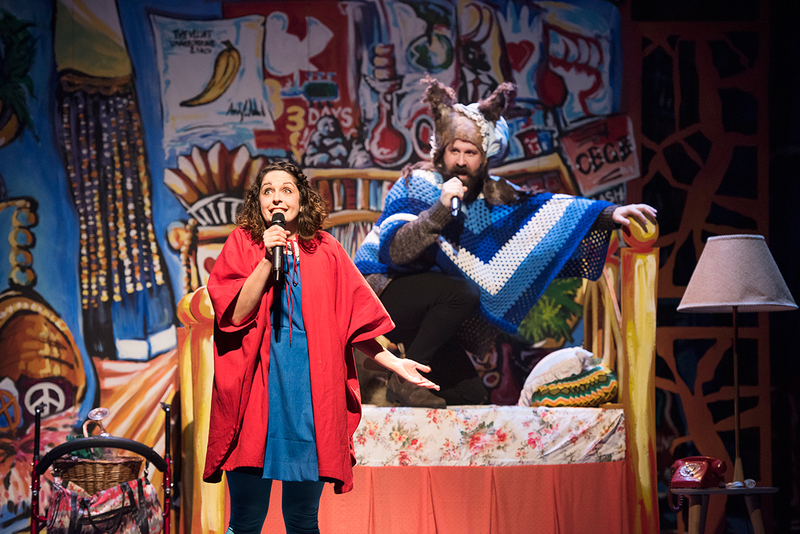 In heater Replacement’s fourth year of partnering with The Cultch to bring the East Van Panto to life, it has become even more localized and specific to the areas surrounding the York Theatre. For everyone who is familiar with this area, this is probably a welcome progression, but for everyone else it can seem a bit alienating. Now I’m not saying that you have to be from East Van to enjoy this panto. There are plenty of political references, corny jokes, and generally wacky antics to keep everyone entertained, but with all the talk about the Adanac bike route (located just a block away from the theatre) and other local references, some audience members may, as I did, begin to feel as if you might not be grasping the full effect of the hilarity. The show opened with the incomparable Veda Hille effortlessly serenading us with housekeeping notes, followed by a prologue by the corny Holiday Claus (dressed in an orange jumpsuit with gold tinsel trim). Although the show made many political jokes, the prologue contained the only mention of Trump, which was probably for the best. Instead they stuck to lampooning provincial and municipal politics with mentions of Gregor Robinson and bike routes, real estate (of course), and the Vancouver School Board). Overall, these current event elements were skewed towards being East Van specific. Little Red (Rachel Aberle) is accidentally left home alone when her overprotective dads go to father-father-daughter djembe class. She decides to bike to her grandma Roxy’s house, who lives in the Woodward’s building, which is also on the Adanac bike route. In the course of her journey she encounters many interesting characters such as the Wheelman who collects bike wheels, the hungry wolf, and the three little pigs. In a twist only possible in the world of pantomime, Little Red ends up in the wolf’s stomach with two of the three little pigs. Little Red and the entire cast and ensemble made this energetic show highly enjoyable, right down to the corny jokes. The half-bike props and sets with beautifully painted houses on the Adanac bike route really rounded out this play’s already strong sense of place. As Little Red follows the big red W in the sky to her grandma Roxy’s house, we’re entertained by hilariously re-imagined pop songs, little pigs with big butts, and wacky characters all along the bike route. As pantos go, this one is top notch, and if you live in East Van you’ll appreciate it all that much more.